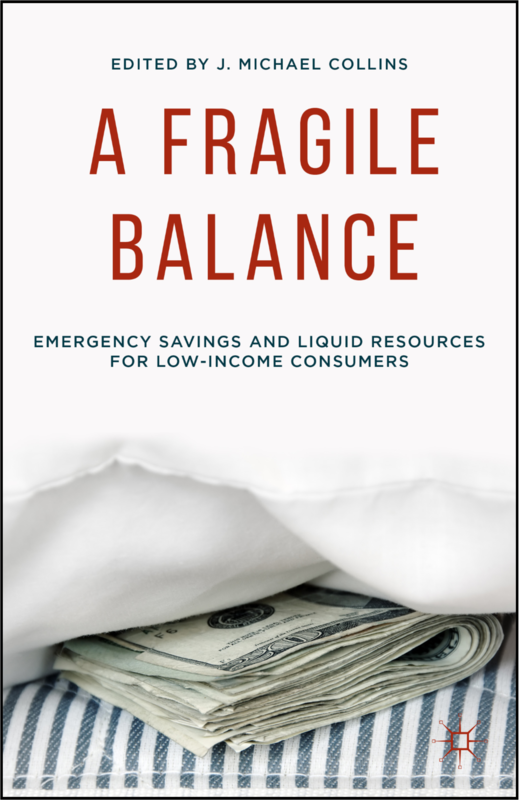 The Center for Financial Security is pleased to announce that A Fragile Balance: Emergency Savings and Liquid Resources for Low-Income Consumers, edited by J. Michael Collins, is now available. The book is can be purchased direct from the publisher and through online booksellers including Amazon, Barnes & Noble, and Powell’s. Existing policies and programs that promote savings largely focus on longer-term savings–often for retirement, education, or homeownership. These policies and programs commonly prevent consumers from using their savings for other purposes, or heavily penalize them for doing so. Meanwhile, emerging research highlights the importance of shorter-term, unrestricted “emergency savings” to households’ financial well-being. Emergency savings helps families weather unexpected expenses and drops in income, and allows them to take advantage of unanticipated opportunities. A Fragile Balance opens by making the case why emergency savings deserves more attention from the public, nonprofit, and for-profit sectors, and turns to the failure of federal policy to support emergency savings among lower-income consumers. The bulk of the book then outlines specific innovations in savings policies, products, and services aimed at supporting emergency savings. Each chapter is by an expert contributor and engages critical questions around the scale, institutional capacity, sustainability, accessibility, and effectiveness of existing and proposed programs. Although many Americans across the income distribution lack emergency savings funds, A Fragile Balance focuses on lower-income consumers, who often have the least options for finding cash in a pinch.